Copyright (c) – Passion Music Ltd.
All translations produced and mixed @ the Galaxial Pharmaceutical, London 2001. Distributed by The Entertainment Network / 3mv. Jumpin' & Pumpin' A division of Passion Music Ltd. Released as almost identical version with plain yellow disc. A timeless house/goa classic, one of my favourite ever. To precise Puzl_Munkey's comment (on the EP release), the feminine voice you can heard at the beginning fo the track was sampled from Dead Can Dance's "Dawn Of The Iconoclast" (album "Within The Realm Of A Dying Sun"), it's played at different speeds. There, got that out of the way. But I love PNG Translations! If you like the old FSOL, like me, then you should find a lot to like about this album. T1 needs no comment. T2 is a wonderful, playful take on (or precursor to?) The Lovers, crossed with PNG. With only slight hints of hippy cheese, the melodies, bassline and builds are simply wonderful. A brilliant track. T3 is an extended but nearly identical copy of The Lovers from Isness. That was the only track I remotely liked on Isness. Its only sin is the psych guitar wailing through the last quarter. But on repeated listens, it's not too bad. I might even go so far as to say it works. If you don't like the guitar, hit skip at 6:00. T4 is the hippiest track on the album. Not wonderful, but not completely awful: a cross between ambient and psych rock. It's inoffensive enough to go by without really noticing. T6 is a tour de force track. I dare old-time fans not to like this one. Simple chimey-organ notes underlie the whole track as it builds to a climax. A smooth sax and some fancy drum work top it off. Brilliant. T7 is an insanely silky downtempo track. Sparse sitars and sax set the mood. A great plingy melody comes in along with processed vocals from PNG. For some reason they remind me of the vocals from Banco's Helipolis. A superb end to a worthwhile album! So you have 1 hippy track, 2 half-hippy tracks, and the rest old-FSOL enough to keep those of us listening to FSOL since 1991 very happy indeed. The year is 2001. The place is London. The sound is very new. After four years absent from the frontline, The Future Sound of London are set to return. A lot has happened since the nihilistic robotic bleep-thrash of We Have Explosive had hit the electronica wave of 1997 and charted well. The FSOL had spent five years trying to remove their music from the Techno shelf of the music shop, only for Virgin's marketing department to jump on the first mintable record they'd made in years and throw them back to square one. The new FSOL is different. The 1970s are referenced. Pink Floyd references are made. Music journalists everywhere scratch their heads. The FSOL have been reborn as a strange, 21st Century prog-rock act. Between the full-on change of The Isness in 2002 and the haunting sampledelica electronic-ambient of Dead Cities there needs to be a acclimatising record. Enter Papua New Guinea: still their most loved track and their greatest moment. The concept is simple: ever since Papua, every FSOL single has been a mini-album all to itself, with the extensive paths of each track explored. Papua New Guinea is the only notable FSOL single to be released in lowly remix-tagged-on format. 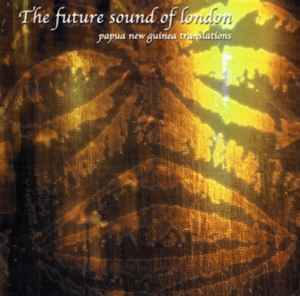 So the Future Sound of London will ready the world for their new incarnation with the first "pure" edition of Papua New Guinea. Is it any good? It starts off magnificently. The 12" mix of Papua is as masterful as ever: rhythm, soul and atmosphere meld in perfect amounts. The Papsico Translation follows up nicely, retaining the idyllic tropical vibe. The dancefloor beats are dropped in favour of gorgeous bass-guitar and endless layers of weightless synths. The Lovers keep the momentum going with lovely retro guitar flicks and bongos, as well as an extensive guitar solo to close on. However, from then onwards it rapidly goes downhill into self-indulgence. The lavish production and high concept aren't backed up by any musical quality. Long before the end you get the biting impression that the FSOL didn't have the ideas to justify this album as an entity. It's a cool idea that doesn't deserve a 45 minute mega-EP to exhaust. At the end of the day, Papua New Guinea was so close to perfection that there's only so much you can do with it of any worth, and after years of seeing producers piggy-back the track's classic status to a cheap buck, it turns out that The FSOL are just as guilty.